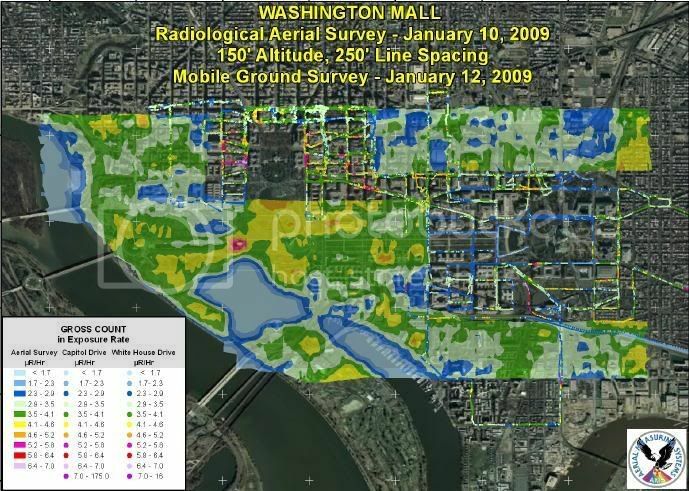 A pre-inauguration DOE/NSA study of radioactivity in the downtown DC area has just been released. They obviously didn't find any significant man-made radioactivity, as the ceremony went off without (much) disturbance. Now the report stands as a testament to the level of security last January and (for DC natives) a powerful alternative look at the streets we know and love. There is one horrifyingly fitting piece of the report. See that lone big purple blotch in the middle/left of the map? That's the WWII memorial. Apparently, it was built with mildly radioactive materials. Yeah, and not a good sign for the WWII memorial. I really like that memorial, but I'd be lying if this won't in the back of my mind next time I'm down there! that is some bittersweet irony for the the WWII memorial. almost like it was left over from when the bomb was dropped.